It is important to develop computational thinking. In my last blog about computer science learning standards, I wrote about the benefits of students learning to program. Coding was once thought to be a mysterious, obscure skill restricted to a few masterminds. But in light of the STEM demands of the future job world, it’s now considered the ‘new literacy’. Learning to code prepares students for the challenges of the careers of tomorrow. Not only are computers an integral part of daily life but learning how to engage with and control them is a powerful leverage that we can give our young people. Additionally, programming teaches skills that apply to all jobs: logical or computational thinking, flexibility, persistence, problem-solving, confidence, creativity, and collaboration. Best of all, it’s challenging and it’s fun! Computational thinking is the ability to break down a big problem into smaller sub-problems and to arrange them in an appropriate sequence. It’s a step-by-step procedure that is the foundation of science hypotheses and experiments, diagnoses such as medical evaluations and mechanical problems, and even tying up shoelaces. This cognitive, methodical approach to problem solving is the basis of algorithmic thinking: define the steps to complete the task. How can computational thinking be taught? Now that there are graphical programming tools such as Scratch and ScratchJr to teach coding to very young students, we should prepare them to think in a sequential, logical way. Before turning to the computer, break down some simple daily tasks into steps. Here are some offline activities to try. Have students list all the ‘baby steps’, in the correct order, to complete a task. Then you may want to put their lists to the test by having one student instruct another to follow the steps literally as directed! Place the open end of the balloon between your thumb and index finger. Put the open end of the balloon into your mouth. Squeeze the open end of the balloon shut. Continue to blow until the balloon is full of air. Tie the open end of the balloon into a knot. Before using the blocks in Scratch have students explain, in their own words, what steps are needed to perform a task. Then take 10 steps forward. 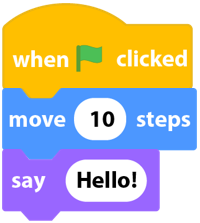 After the steps have been explained verbally or written in natural language sentences, then go to the Scratch program and find the coding blocks that will perform those steps. Preparing students to think logically and plan their ideas using their own words offline first will ensure success as they begin to construct code. 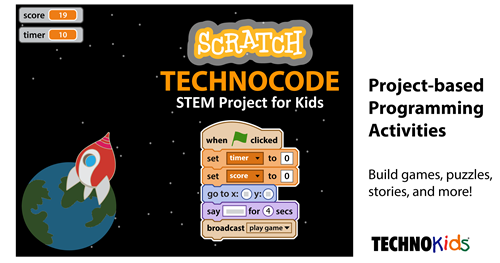 Develop computational thinking skills using Scratch lessons in TechnoCode. Are you looking for programming lessons for kids? 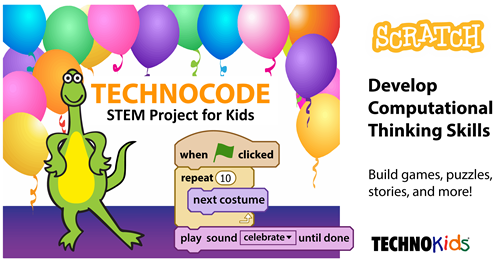 TechnoCode, a STEM project, includes activities that emphasize computational thinking. 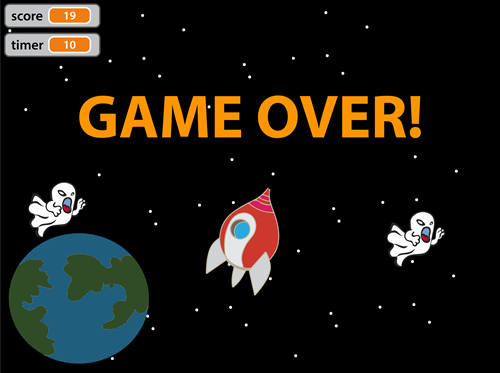 The lesson plans use Scratch to build games, puzzles, and animations. The instructional goal is to have students think like programmers. Easy to follow instructions with natural language help students to understand coding. Resources include planning sheets with guiding questions, coding challenges to differentiate learning, and coding journals.